William Ray Bowlin, ed. 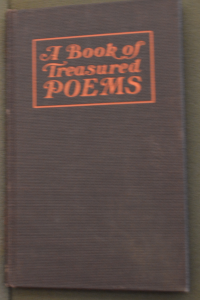 A Book of Treasured Poems. Chicago, New York: Laidlaw Brothers, 1928. Front Cover. 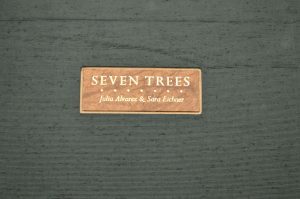 Julia Alvarez, Seven Trees. North Andover, Mass. : Kat Ran Press 1998. Front Cover. 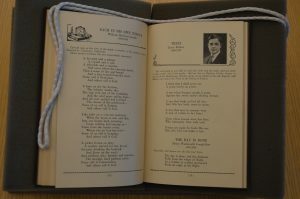 The day that I found A Book of Treasured Poems by William Ray Bowlin in the Watkinson library, I was thinking about trees. Trinity’s campus is surrounded by elm and maple trees, and our alma mater even focuses on the way that we’ve grown and changed while beneath these elms. Finding Bowlin’s book unintentionally coincided with my search for trees that day. 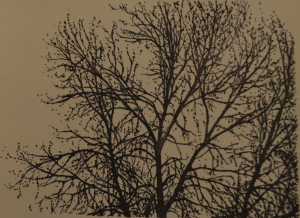 A few days before I became enamored with Julia Alvarez’s beautifully illustrated Seven Trees. Alvarez’s book stood out due to its beauty both linguistically and artistically. Julia Alvarez, Seven Trees. North Andover, Mass. : Kat Ran Press 1998. Yet, I decided to focus on Bowlin’s book not due to its slight connection to trees but instead due to the editorial choices that he made to ensure that this book came out the way he desired. Chicago, New York: Laidlaw Brothers, 1928, 78-89. 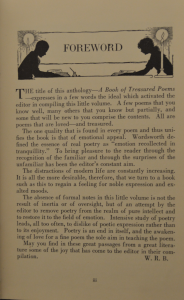 If you look solely at the physical attributes of A Book of Treasured Poems, you would not be extremely fascinated. Bowlin’s publishers stuck to a very traditional template when creating this book. Yet, it is not only the outside that is lackluster in comparison to the contents. There are few extraneous details in this book, the exception being the small images of authors or ones that were inspired by the text. Bowlin explains this choice along with others in his foreword. He writers, “the absence of formal notes in this little volume is not the result of inertia or of oversight, but an attempt by the editor to remove poetry from the realm of pure intellect and to restore it to the field of emotion.” (iii) Although Bowlin was primarily referring to the lack of annotations, notes, and other forms of scholarly conversation, he does note that the main function of this book is to connect poetry back to emotions. This would involve taking away images and bindings that were associated with the scholarly or the profound. The book while simple is beautiful; the cover is a thick dark brown fabric with the title stamped in a bright orange at the top. Bowlin did not place his name on the cover further highlighting his desire for the attention to remain on the content rather than the form. The small images of authors next to the titles and the small comments describing their importance does bring in a slight air of sophistication yet it does not strip away from the focus on the text. Chicago, New York: Laidlaw Brothers, 1928, iii. Although Alvarez’ poems and the associated illustrations are beautiful and perfectly connect nature and life, Bowlin’s collection brought back memories to the spring semester. One of the final projects that we had to work on was a commonplace book. This practice began in the 15th century Italy and spread to England by the 17th. Commonplacing hold a special place in my heart since it allows for the commonplacer to act as an editor, illustrator, and author all at once. Since it is an extremely personalized activity, it allows for you to engage with your favorite texts. Bowlin’s collection stood out since it allowed for us to see the different styles of commonplacing. Out of the books that I looked at while in the Watkinson’s, Bowlin’s A Book of Treasured Poems appears to be one that marries the form with the content the best. While sticking to a demure and understated color pattern for the images and binding, it is easy for the reader to zero in on the poems and understand the editor’s intent. I find that compilations of various authors work provide us with easier access to overarching themes that take place in literature. Books in all forms share the ability to form connections between readers and the authors. Yet the beauty of collections is that the reader receives a clear understanding of what the author desired to express.